Mr. Dominick A. Faust Sr., age 81, husband of Margaret S. (Rein) Faust, of Limerick, PA, passed away on Tuesday, June 26, 2018 at home. Born on June 13, 1937 in Philadelphia, PA, he was a son of the late Dominick and Anna (Pisasale) Faust. Dominick graduated from Southern High School, attended Temple University, and served in the United States Army. He worked as a credit manager for Total Petro. Mr. Faust was an active member of St. Teresa of Calcutta R.C. Church in Schwenksville, where he loved serving as a Eucharistic minister, was Captain of the Hospitality Ministry, and served on the church festival committee. He was also a member of the Knights of Columbus, Council #15456. 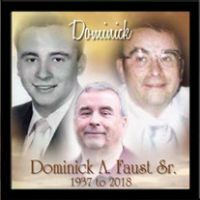 Dominick served on the Board of Directors for the Merion Homeowners Association, as well as the Treasurer for both the Juniata Park Boys Club along with the Father's and Mother's Association for Northeast Catholic High School, where he continued to serve even after his children graduated. Raising his four wonderful children was his greatest life accomplishment, as was evident from his coaching them from T-ball all the way through American Legion baseball, along with the time he spent umpiring baseball and refereeing basketball and football. He enjoyed taking trips to the casino and reading a good book. In addition to his wife of 60 years, Dominick is survived by four children, Dominick A. Jr., husband of Joyclyn Faust of Royersford, PA, Michael E. Faust of Philadelphia, PA, Peggy A., wife of Bill Chapman of Royersford, PA, and Maria A. Faust of Limerick, PA; five grandchildren, Kenneth G. Hagmann, Jr., Andrew D. Hagmann, Rebecca E. Faust, Vincent A. Hagmann, and Dominick A. Faust, III. Relatives and friends are invited to attend his funeral mass at St. Teresa of Calcutta R.C. Church, 256 Swamp Pike, Schwenksville, Pennsylvania on Friday, June 29, 2018 at 12:30 pm. Officiating will be Rev. Paul C. Brandt. Entombment will be held in the Limerick Garden of Memories. Friends will be received from 9:30 am - 11:30 am Friday at the Cattermole - Klotzbach Funeral Home, 600 Washington Street, Royersford, PA 19468. In lieu of flowers, memorial contributions may be made in his name to the St. Teresa of Calcutta R.C. Church at the address above. Condolences may be made by visiting www.RoyersfordFuneralHome.com. Arrangements are being handled by the Cattermole - Klotzbach Funeral Home, Royersford, Pennsylvania.